Content marketing vs native advertising—which should you use? Content marketing and native advertising appear to be similar insofar as they provide useful information for prospects, customers and the public in a branded experience. Yet there’s a critical distinction between content marketing and native advertising. Content marketing is non-promotional, owned media while native advertising is a paid message with a promotional goal. Before examining content marketing versus native advertising, let’s define the terms. Content marketing is high quality, relevant information that’s totally void of promotion. It’s created by brands as a form of owned media. Content marketing incorporates brand attributes and stories. It provides prospects, customers, influencers and the public with useful information that educates and entertains. This enables it to engage and build trust with its audience while making emotional connections. Content marketing may be placed or shared on other media entities, such as social media, to expand its reach. Further, advertising may be used to support third party platform distribution. Since most businesses don’t have a large owned media audience, the biggest challenge content marketers face (beyond the perennially insufficient resources and content production problems) is building their house file of readers with the potential to become customers. This is the reason marketers use advertising. Get your content marketing on track with this checklist. Native advertising is a form of paid media where the advertisement appears to be an integral part of the media entity’s content. 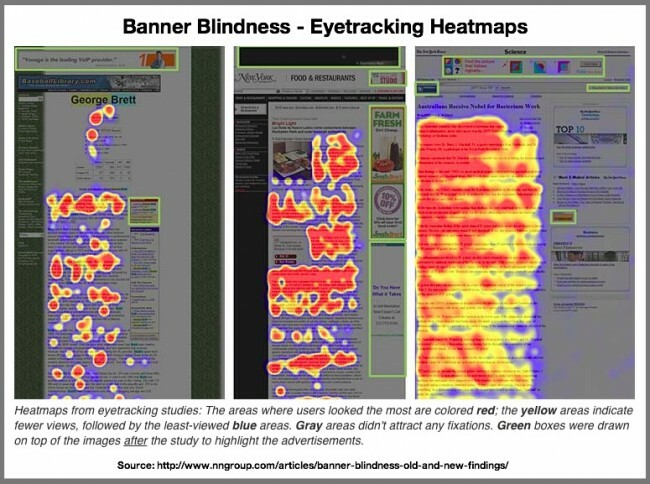 Usability expert Jakob Nielsen discovered that native advertising is the one exception to banner blindness where online readers ignore anything they think is an ad or other promotion. The more the native ad emulates the site’s content and appears to be part of it, the more users look at it. According to Altimeter’s Rebecca Lieb, native advertising combines paid and owned media into a commercial message that’s fully integrated into, and often unique to, a specific delivery platform. Lieb makes it clear that the commercial relationship between the advertiser and the media entity must be clearly delineated. 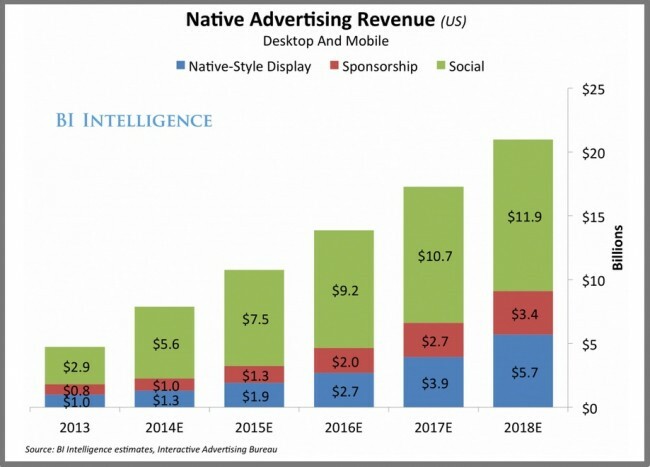 Native advertising will increase to $21 billion in 2018 projections, almost double the $10.7 billion estimated in 2015 according to Business Insider. 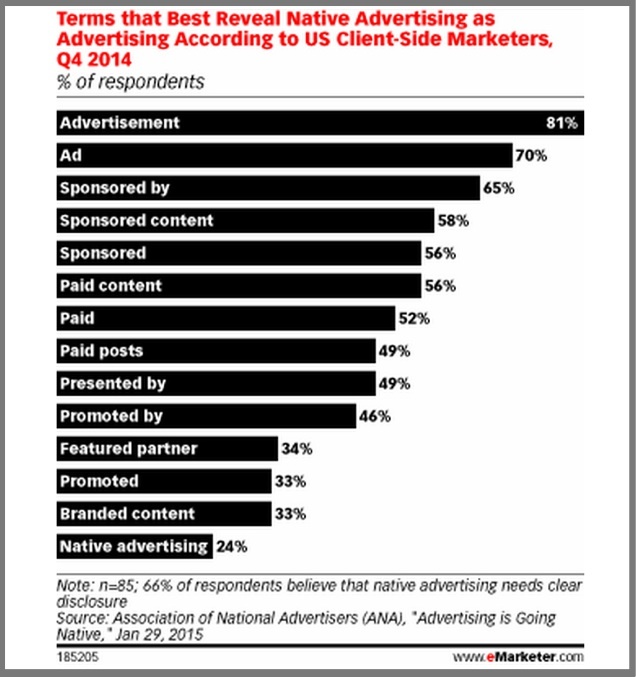 66% of US client-side marketers plan to increase their native ad budgets in 2015, up from 55% in 2014 according to the Association of National Advertisers (ANA) study for Q42014 as reported by eMarketer. Advertisers’ rationale echo Jakob Nielsen’s findings: Native ads should be contextually relevant to surrounding editorial content and look like it. 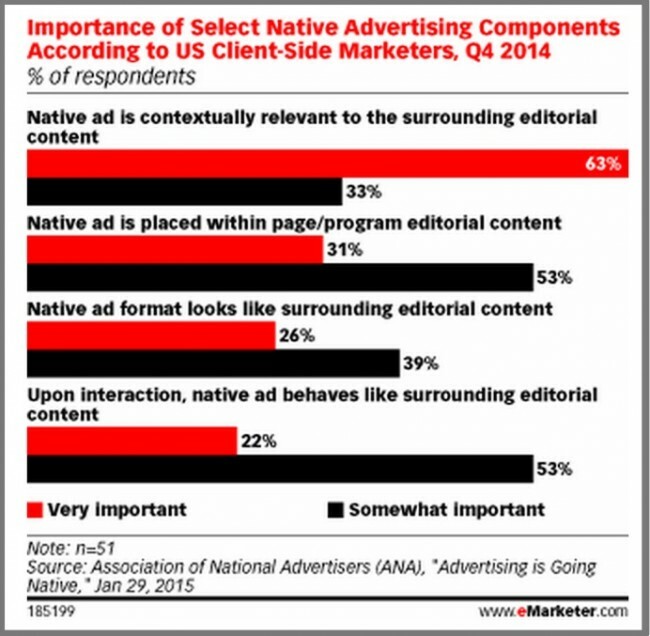 Two-thirds of ANA respondents agreed with Lieb that native advertising requires clear disclosure, while 13% disagreed. What’s interesting is the number of different wording options. When it comes to content marketing vs native advertising, there are 5 salient factors to consider. Extend reach. Build your owned media audience by attracting new readers. Support purchase cycle. Provide information at every step of the buying cycle. Establish thought leadership. Become known in your category as an influencer. It doesn’t have to be your c-suite; it can be a technical expert. Expand reach. Leverages the third party media’s existing audience to attract new readers. Drive lead generation and sales. Provide sales-focused information that appears to be part of the third party media’s editorial. Increase visibility. Use a third party media entity to take advantage of their reach and reader credibility. Website. This is your online home base. Have related landing pages for your content marketing to build your house file and close sales. Blog. Use your blog to provide your audience with the 5 basic types of content prospects and customers actively seek. Also support search optimization through the use of keywords and links. Email. Leverage your house file to distribute your content. Don’t underestimate the value of your other emailings including customer service, purchase confirmations and employee communications. Retail. Distribute content in your stores and other locations. Include handouts and television. Print and other offline If you still use these formats, reference and/or include your content marketing on them. Social media. Supplement content marketing distribution with paid advertising. Third party online. Augment your content marketing to leverage contextually relevant third party media. Third party offline. Is similar to online third party media. Own content assets. By creating content marketing, you add assets to your business that have a tangible benefit, especially if you have a house file of potential and existing customers. Interbrand research has shown that high quality brands increase corporate value. Is non-promotional. Customers ignore promotion. It’s a turnoff. Content marketing by its nature provides useful information your audience actively seeks. Has broad reach. Third party media entities tend to have larger audiences than most businesses. Leverage existing audience. The ability to present your information to an existing audience reduces the work and cost of building your own audience. This is a reason marketers traditionally use advertising. Lack broad reach. Most companies have a small base of prospects and customers. While companies can legally add customers to their email file, it’s better to get their permission. Get lost in the noise. With the increase in the amount of content that the average person sees in a day, your content is challenged to break through without additional advertising support. Internal influencers help overcome this challenge. Is distinguished as promotion. Regardless of the term used, the greater the distinction between advertising and editorial content on third party media, the more likely readers will avoid it. May be considered an ad. Despite the third party media’s best efforts to make your “content” appear to be editorial, never under-estimate your readers advertising savvy and desire to avoid it. Requires content creators. Content marketing can be developed by employees, customers, freelancers and/or agencies (advertising, content or marketing). This requires both people and budget. Need content optimization. You must make your content appealing to both people and search engines. This entails copyediting, optimization, images, and technology. Must distribute content. Just publishing content isn’t enough for most businesses. You must actively distribute it across media platforms to maximize your reach. Depending on the media platform, you may need additional technology, employees and/or advertising. Need an advertising budget. Despite blurring the editorial lines, native advertising requires financial support. May need to create content. Regardless of whether you, the third party media or your agency does it, the “content” must be developed. Since it must appear to be part of the media entity, it’s often best if they create it. There may be an additional fee. While content marketing and native advertising both provide useful information, they differ in one significant way. Native advertising is a paid message with promotional intent. Executed well, both content marketing and native advertising can attract your target audience and persuade them to take the next action towards purchase. 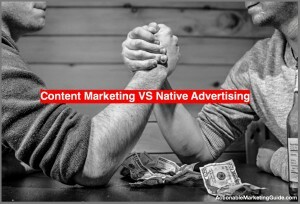 How do you think content marketing and native advertising differ? What roles do they play in your overall marketing plans? 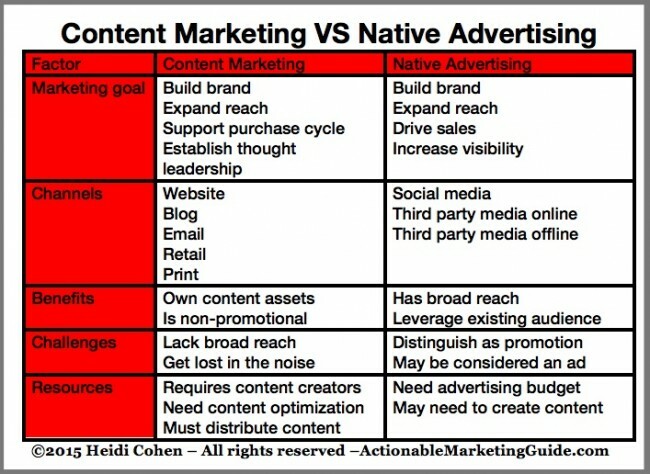 Tags Business Insider, Chart, content marketing vs native advertising, eMarketer, Jakob, Native Advertising, Rebecca Lieb. Bookmark the permalink.